Furniture products undergo extensive usage and hence face a daily wear and tear. Dust and dirt are other factors that contribute to the furniture damage. Many times, this damage will provoke you to change your upholstery in shorter spans of time. However, rather than purchasing, good maintenance can be a better solution in all respects. Professional cleaners use the right sort of chemicals to get rid of the stains and dust and every service can impart a fresh new look to your furniture. So, why not seek regular professional upholstery cleaning to prolong the life of your furniture. Being professional cleaners, they are aware of the type of chemicals to be used based on the sensitivity of the material of the furniture where a layman like us definitely fail. If you’re a fan of delicate fabrics and materials like silk in your furniture items but scared to purchase considering the maintenance, then don’t worry Toms Upholstery Cleaning Melbourne is a service that will take care of all your needs the way they should be taken care of. Use of excess water can penetrate and damage the core of your furniture. This is the major cause of damage to the upholstery in most of the cases. While the professionals are very well aware of the amount of water to be used and the best ways to dry the furnitures completely. 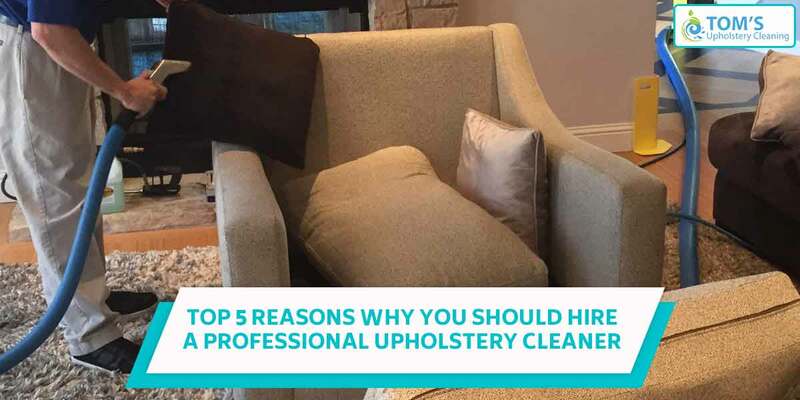 Hence, rather than investing time in cleaning the upholstery yourself and rather getting it damaged, it is always advisable to go for professional upholstery cleaner. With everyday usage, spilling food, bacterial growth etc can result in bad odours in your furniture which is definitely not encouraged. Getting professional cleaning will help you in getting rid of these nasty odours and imparting a fresh new fragrance for your furniture. Even after the regular use of vacuum cleaners, dust and pollens can get stuck in the fabrics of your furniture and goods. These are promoters of allergy causing dust mites and may result in sensitivity. So if you want your home to stay free of allergens professional upholstery cleaning is the solution. As you now know how important it is to hire professional services for upholstery cleaning, you can readily get these services from Toms Upholstery Cleaning services based in Melbourne. To avail their services, you can get in touch with them on 1300 068 194.